You know the problem, as I’m sure I’m not the only one. You set out out on a photo-shoot to a great location, arrive in good time, get a great spot, set up you gear, and carefully compose your frame. Then by some magic of nature, that fantastic light you’d dreamed of suddenly appears and the scene before you is transformed. You snap away with merry abandon, filling up the memory card with an abundance of frames, not wanting to miss every subtle change in the light, thinking you’ve definitely bagged a winner since it looks great on the LCD. But then you get home and are hugely disappointed when you see them on your computer screen. With me it’s usually because I ’ve screwed up somehow, got something not quite right in camera, or more often than not, I didn’t get it focused sharp enough. Exposure problems can be usually recovered in RAW to some extent, but focussing errors, ugh .. you’re scuppered. Well enough of the bad tales, this is one location I didn’t screw up, and one I feel I got everything just right and at the right moment. 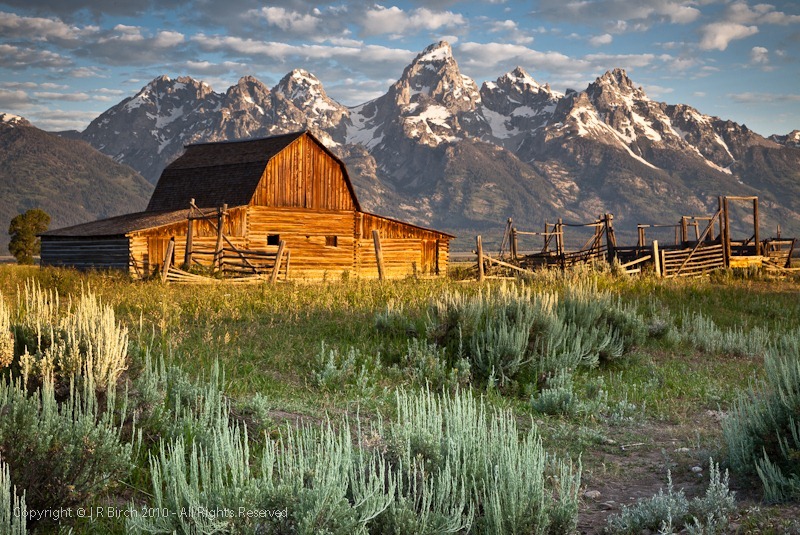 The location, if you don’t know already is one of the Mouton Barns on Mormon Row, in Antelope Flats part of Grand Teton National Park, Wyoming. It’s one of those iconic photo locations that has appeared on countless posters, books, postcards and in numerous magazines, and it’s not surprising too as it really is just almost the most perfect landscape setting you can encounter. It has that amazing balance between the raw, impressive work of nature that has sculptured the jagged Teton Peaks and decaying touch of human intervention to the landscape that makes the scene so appealing.The barns and several other buildings are all of what survives from a series of homesteads built by Mormon settlers who began to arrive from Idaho in the 1890’s. They now extrude that beautiful, natural, weathered finish on the road to decay, that now makes them seem a natural element within the landscape. Looking at the scene it’s hard to imagine that once hundreds of people lived here, as now just remnants five old homesteads remain. There are in fact, two Moulton barns on Mormon Row, built by brothers John and Thomas Alma Moulton, but if it hadn’t been for the work of local journalist and family descendant Candy V. Moulton in the early 1990’s the barns may not have survived. Thankfully, due to her publicity bringing the plight of the barns to public attention, these iconic buildings will now be preserved by the National Park Service for future generations to see. 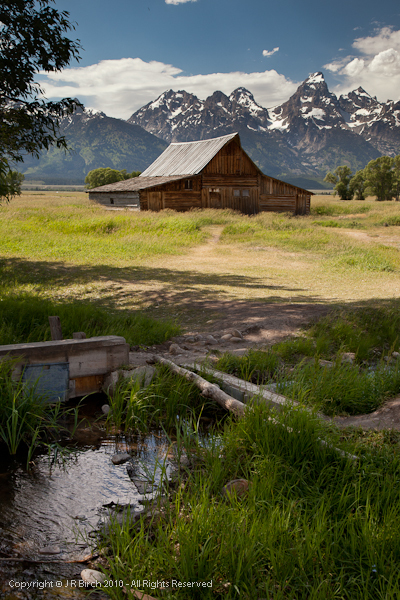 Mormon Row is about 16 miles from Jackson Hole and can be easily reached driving northwards along US-191 (US-89, US-26). Allow about 25 minutes to get there. After around 14 miles turn right on to Antelope Flats Road, If your travelling out before sunrise you should just be able to make out the dark shadow of Blackrail Butte on your right, but don’t make the mistake of turning left down Blacktail Butte Road, as Antelope Flats Road is the next left after this just past the hill. Then follow Antelope Flats Road for Eastward’s for 1.7 miles to the junction of Mormon Row. A link to a Google Map with directions from Jackson can be found here. There is a small gravel parking lot on the north side of the junction of Mormon Row and Antelope Flats Road, as you can’t drive along the northern stretch of Mormon Row, but from here it’s just 200 yards to John Moulton Barn along the track. Most all of the ‘classic’ shots I’ve seen of this barn are typically taken much further back, using longer focal length lenses, probably from locations further down Antelope Flats Road. These compositions usually show very little foreground, typically placing the barn at the bottom of the photograph. 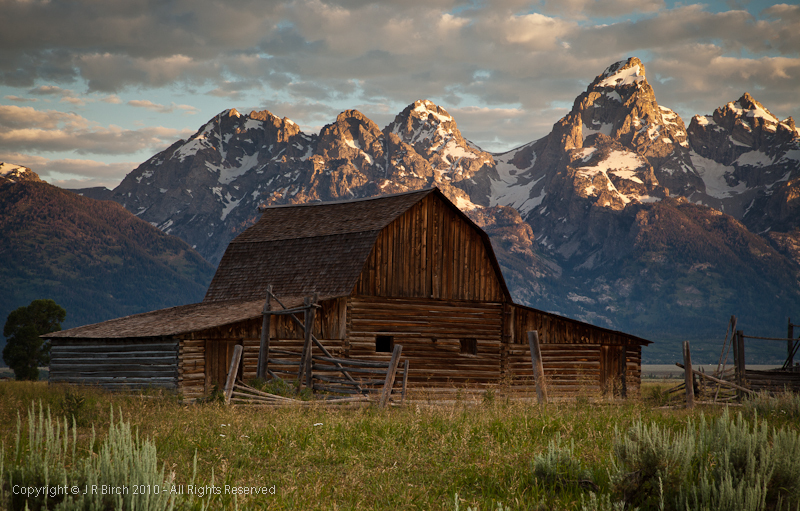 They do however, have the advantage of showing much more of the mountains above the barn, and you can position your tripod so the apex of the barn roof aligns nicely under (or very slightly offset) Grand Teton peak, which at 13,770 ft is the highest peak in the Teton range. However, that was not the shot I was looking for as I prefer foreground interest, even at the risk of reducing the mountains prominence within the frame. I had visited the location the day before with my family, so had a chance to scout out a suitable spot and knew roughly where I wanted my tripod to be. As I headed out the following morning the skies were rather cloudy, and by the time I drove past the Jackson Hole airport light rain had started to fall. Luckily, by the time I arrived in the gravel parking lot, the rain had ceased, and the dim early morning light seemed to show some nice cloud formations behind the mountains. After the rain the strong scent of sage filled the air. Thick cloud was on the eastern horizon however, which cast doubts the clouds would clear before sun up. I located a nice gravel area amongst the sage brush which formed a sort of pathway leading into into the frame. To get to this area I had to cross the stream which runs parallel to the eastern side of the track, and then walk about 10 yards further south east. By the time I’d set up another photographer arrived and began assembling a 8 x 10 large format camera nearby whilst we chatted and waited for the light. My fear was that other photographers arriving would tempted to set up right in front of the barn, spoiling our view, and it only took a few more minutes before one tried. However, after some gentle prompting we persuade him ours was the best vantage point. Several more photographers arrived soon after, but surprisingly few with tripods. The time for sunrise came and past but the light remained flat. The clouds above the Teton’s briefly took on a slight pinkish hue, but I was beginning to think ‘golden hour’ light would not reach the barn. Slowly the tops of the Teton’s appeared in sunlight, but lacked warmth and colour. The light crept down the mountain sides, lighting the range from top to bottom but no decent light fell on the front of the barn. Then, if by magic, the clouds parted and golden, warm rays hit the face of the barn and the whole scene tool on an extra dimension. The barn glowed, almost orange in colour. It was an amazing scene which I watched and photographed till the light subsided. I was last to leave. I used a 3 stop Lee ND hard grad (I seldom use soft grads) and found it worked best if I set the base of the grad where the top of the foreground shadow, just below the barn. When the intensity of the golden light began to fade I switched to a 2 stop. A polarizer did help a little too. My photographs were later processed in Adobe Lightroom where I further darkened the blues in the sky, lightened the foreground slightly, and made adjustments to the tone curve, contrast, and clarity. I was really pleased with the results. I made my shot in late July, but I’ve read June is very good. Bear in mind this area spends a large part of the year under snow, and in the winter Antelope Flats Road is only ploughed for the first mile to a parking turnout, the rest being closed till May. I’ve also see some great Autumn shots, especially the southern barn which has a row of trees nearby where you can catch some of the fall colour. 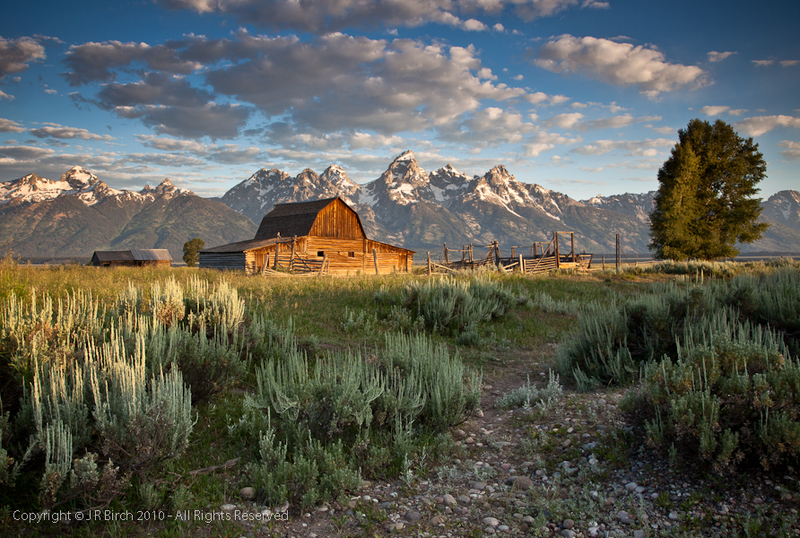 The barns face eastwards so both are great sunrise locations, the best time just when the sun clears the mountains behind and lights up the Teton’s and the face of the barns. Generally the closer to sunrise you capture these, the better that orange glow on the front of the barns is going to be. In my case I had to wait for the sun to break through, but I loved the shots where the sun just started to catch the tips of some of the foreground sagebrush, but that won’t last long. If you’re really lucky you may even get some Bison in your scene too as they roam freely around this area of the park. Schwabacher Landing down by the Green River is not far away, where you can get some great reflections of the Tetons at the river bend and in the beaver ponds nearby. Oxbow Bend, another great sunrise spot is just 22 miles to the north on US-191. 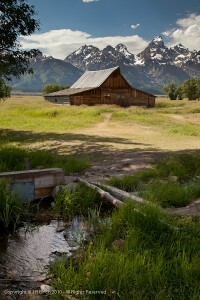 Many thanks for taking your valuable time to post your comments along with the pertinent photographic techniques you used to capture this spectacular image of the Mormon Row Barn/ Grand Tetons. Although I fancy my photographic endeavors more towards the marine environment, I look forward to the fun and challenge of honing my landscape photography skills on my next trip out west. Mormon Row Barn looks to be a very good starting point. Thanks,again.